Based in New Jersey and founded in 1979 as Arsenault Associates, Dossier Systems has more than 30 years of industry experience and a track record of innovation, specializes in developing fleet maintenance software. The company operates on the basis of its philosophy that “the customer is everything,” and it works to meet their needs with superior products. Dossier, available in Essentials and Professional editions, includes the option of being purchased as software as a service (SaaS), which means that Dossier supplies and maintains the hardware concerns (such as the servers), which allows for perks such as automatic backup. The Essentials Edition of the company’s fleet management software caters to those businesses which have contracts with dealerships for the maintenance and repair of equipment, or companies that lease equipment. Its features include automated scheduling, tracking transportation costs per mile and handling repair orders. The Professional Edition is designed to fit the needs of companies which own, maintain and repair their own equipment. This application provides clients with parts inventory functions including automated reordering, warranty management and a downtime tracking capability. 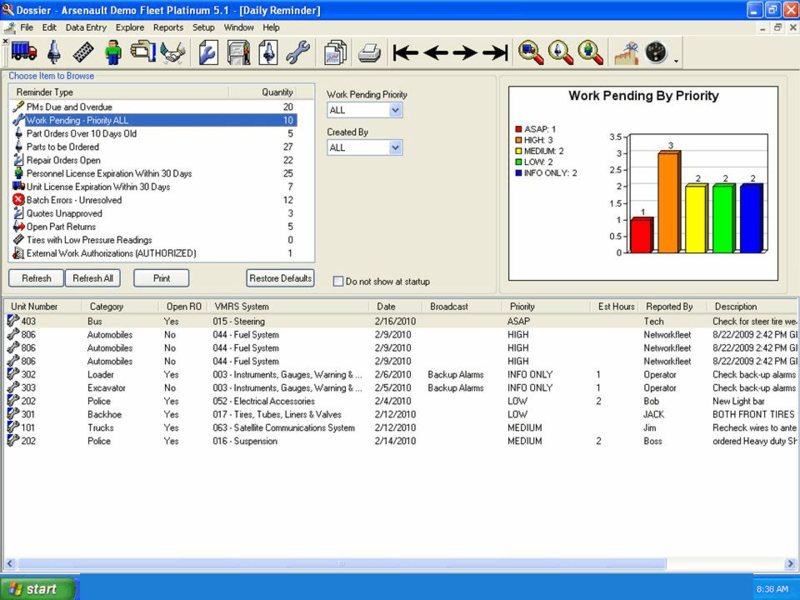 Dossier Professional alone includes integrated inventory control software so, in addition to fleet operations management, Dossier Professional customers have access to functions which include purchase history creation, cross referencing of an unlimited number of parts and automated valuation tracking of multiple individual parts. Dossier has improved the fleet operations of a number of trucking companies. Petrocard Systems, Inc. utilizes Dossier to track and report their vehicle maintenance services, mileage and expenses for in-house and outsource vendors. New World Van Lines uses Dossier to monitor, and manage all aspects of their fleet, including parts usage and inventories, mechanic productivity, service intervals, fuel management, cost per mile and fleet efficiencies. Learn everything you need to know about Dossier. Our experts will reach out to you shortly.